Sports Teams in/near Downtown L.A.
Dodgers Top of the Park Gift Shop - The Dodgers official team store is open daily 10AM to 5PM, so you can purchase Dodger souvenirs, even when it's not baseball season. You can also visit the upper bleachers of the stadium and take pictures of the field below. Outside of the gift shop you'll find a spectacular view of the buildings in downtown L.A. Parking is free! To get there drive up to the stadium and tell the attendant at the gate that you want to go to the gift shop. They will give you a pass and direct you to the parking lot. Dodger Stadium Express - On game days, Metro offers a free shuttle (non-ticket holders pay a small fee) from Union Station to Dodger Stadium. Schedule: Pre-Season: September 30 to October 13, 2017; Regular Season: October 19, 2017 to April 11, 2018. Schedule: Pre-Season: October 1 to 13, 2017; Regular Season: October 19, 2017 to April 11, 2018. Schedule: Season is limited. Next match is April 14, 2018 in San Diego. Description: Classic roller derby action on a banked roller skating track. The L.A. Derby Dolls is a league comprised of four local teams that meet for two matches per month, except July. Championships begin in December. The L.A. Ri-Ettes are L.A. Derby Dolls' all-star team that competes on a national level. Practices (open to public): July 29 to August 17, 2017; The Los Angeles Rams will host their 2017 Training Camp presented by AT&T at the University of California, Irvine. The 2017 Rams Training Camp will feature 15 practices at UCI that are open to the public, including one joint practice with the Chargers on Wednesday, August 9. All open practices are free to the public. Gates open 90 minutes prior to the start of practice and select players will sign autographs after all open practices. See this link for details. Practices (open to public): July 30 to August 22, 2017; all 13 Chargers practices at Jack Hammett Sports Complex in Costa Mesa are open to the public and free-of-charge. See website for details. Description: The Chargers have moved from San Diego to Los Angeles. Home games will be held at StubHub Center until completion of the sports/entertainment complex in Hollywood Park, when the Chargers will share the facility with the L.A. Rams. Description: L.A.'s championship Major League Soccer (MLS) soccer team. 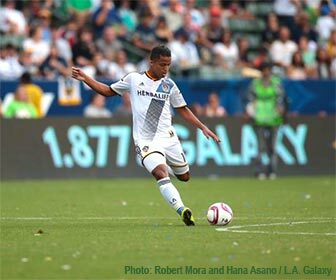 The club also fields a United Soccer League (USL) team called LA Galaxy II. Description: Announced in October 2014, the LAFC team owners include celebrities such as Earvin "Magic" Johnson (basketball player), Will Ferrell (Hollywood actor) and Tony Robbins (motivational speaker). Construction of a new arena is underway at the former site of the Sports Arena, next to the L.A. Memorial Coliseum. Description: The Carson Bobcats are the newest members of the Independent Women's Football League (IWFL). Led by Head Coach Bobby Hosea, the Carson Bobcats bring a veteran roster and coaching staff to the league. Known for his Helmet Free Tackle Training program, Coach Hosea also hopes to share the benefits of safer tackling with the world of women's football by showcasing the technique used by the Bobcats. USC Sports - USC Trojans website - sports teams and sports programs offered by the University of Southern California (USC) next to Exposition Park near downtown Los Angeles. Los Angeles Marathon - Annual 26.2 mile run through the streets of Los Angeles. The next race will be held in March 2019. Description: Originally known as the Los Angeles Angels, the team has gone through a couple of name changes (California Angels and Anaheim Angels), although their home field has been at Angel Stadium of Anaheim (formerly known as Anaheim Stadium) from 1965 to present. Angel Stadium of Anaheim is close to Disneyland. Description: Hockey team that inspired a Disney movie. Honda Center is near Disneyland. These Class A minor league baseball teams are members of the California League. 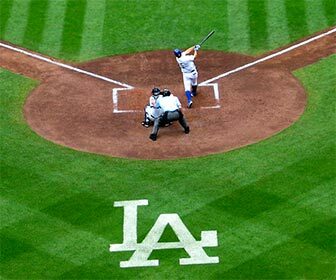 They are about a one-hour drive from downtown Los Angeles, although if you're a fan of baseball then it's worth the trip. Minor League games are exciting and no matter where you sit, you'll have a great view (compared to Dodger Stadium or Angel Stadium). Lancaster JetHawks - Houston Astros affiliate in Lancaster, about 70 miles north of downtown L.A.
Inland Empire 66ers - Los Angeles Angels of Anaheim affiliate in San Bernardino, about 60 miles east of downtown L.A.
Rancho Cucamonga Quakes - Los Angeles Dodgers affiliate in Rancho Cucamonga, about 40 miles east of downtown L.A.
Lake Elsinore Storm - San Diego Padres affiliate in Lake Elsinore, about 70 miles east of downtown L.A.
Dodger Stadium, Elysian Park. See above for more information about tours and visiting the year-round stadium gift shop. Los Angeles Coliseum - Los Angeles Memorial Coliseum and Sports Arena. 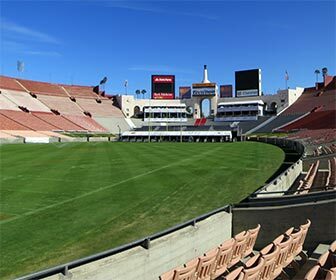 Home field for the USC Trojans football team, as well as occasional sporting events and foot races. The Sports Arena is adjacent to the Coliuseum and hosts occasional basketball and hockey games, plus boxing matches. The Forum - in Inglewood, former home of the Lakers and other sports teams. The Forum is now used for a variety of events, such as concerts, conventions and occasional sporting events. STAPLES Center - Located near the Financial District in downtown Los Angeles, this is the home court of the Lakers, Kings, Clippers and Sparks. The site of many concert and special events. The website has a calendar of events, seating chart and more. StubHub Center (formerly Home Depot Center) - Home of the Los Angeles Galaxy soccer team. 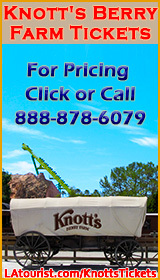 Located in Carson, about 20 miles south of downtown L.A. (10 miles west of Long Beach). Long Beach Grand Prix - (April 13-15, 2018) The annual Indy Car race event held on the public streets of Long Beach. The streets are closed each year for three days during April so that Indy Cars can race through business districts, along the shoreline, and within view of tourist attractions such as Aquarium of the Pacific, Shoreline Village and the Queen Mary. The event also features live entertainment and automobile exhibits. Irwindale Event Center - formerly known as Irwindale Speedway, the facility offers a wide variety of auto and motor vehicle racing events, including stock car racing, sprint cars, midget cars, drag strip racing, motorcycles, monster trucks and various NASCAR events. Located about 25 miles northeast of downtown Los Angeles. L.A. Racing - (Irwindale Speedway) - Drive a stock car for a number of laps, or those with more skill can take a course to learn more about the track and then race against other drivers. Andretti Racing - (AAA Club Speedway, Fontana) - Indy car ride-alongs and driving experiences. Gotham Dream Cars - choose from Ferrari, Bentley, Lamborghini or other performance and luxury cars. Regency Car Rentals - Classic, exotic, prestige and other high-end cars. Santa Anita Park - Santa Anita is one of the most popular race tracks in Los Angeles. Located in Arcadia (near Pasadena), 14 miles northeast of downtown L.A., the track offers seasonal live horse racing. Del Mar Thoroughbred Club (near San Diego) - 20 miles north of San Diego (100 miles south of LA). Seasonal live horse races.